HQ18 Avante by Handi Quilter. An easy reach with expanded quilting possibilities. The expanded space of 18" throat allows quilting of a 12" block on point! 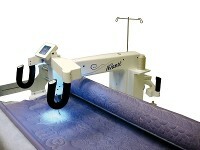 15" of quilting space, 2 kinds of stitch regulation: Precision and Cruise, & Fingertip controls. All kinds of wonderful features. For more information...use the link in our links page to see all the videos etc. Special package pricing available. Give us a call!